Mansfield Melancon’s criminal defense lawyers have experience representing individuals throughout Louisiana. There may be a time when your criminal record gets in the way of you living your life. We all make mistakes, but these mistakes should not prevent us from 1) getting a job 2) buying a home or 3) obtaining a professional license. If you are having trouble with moving forward with your life because of your criminal record, you should contact Mansfield Melancon’s experienced criminal defense lawyers to help you get an expungement of your criminal record. A criminal expungement is the legal process to seal a criminal record. A criminal record can never be destroyed or permanently sealed. However, a criminal record can be sealed from public review. Expungement is usually sought after by those who were never convicted of a crime or who never entered a guilty plea in a case. Those who have been convicted of a crime may seek an expungement of their record if a certain period of time has passed. Sealed court files may be seen by some officials for specific purposes. Those that are allowed to review sealed files include law enforcement officials and some state licensing boards. 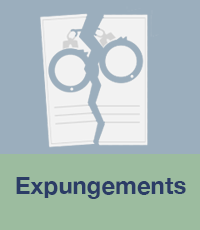 Each jurisdiction has specific guidelines regarding how an expungement may be filed and who is eligible for an expungement. Having a lawyer on your side who is experienced and knowledgeable about the certain laws and guidelines for expungement in your area is vital. Don’t hesitate to contact Mansfield Melancon’s experienced criminal defense lawyers to assist you in the expungement process. If you are in need of reliable legal advice regarding expungements, contact Mansfield Melancon immediately to make sure your rights and interests are being protected. It is important that your constitutional rights are protected. It is equally important to have a team of skilled lawyers who will provide the personalized attention your case requires and deserves. You can reach us at our New Orleans number at 504-500-1108, Baton Rouge number at 225-612-0800, Lafayette number at 337-409-0003, or you can contact us online. You can also send us an email with questions about your claim at info@mansfieldmelancon.com.